Radio interview #3 in Allo la Planète on le Mouv’ (Radio France)! Listen to us from 48’55” to 59’55” ! Article published in the PARIS-NORMANDIE, daily regional newspaper, you can read it below in PDF. Article from our partner the Département de la Seine-Maritime in their June 2014 issue. We are at the page 12 ! Article from Les Échos du Campus, University of Rouen students’ newspaper. The San Francisco French Consulate has made a short video report of our stopover in California. Watch it here! Article by our microcredit partner BABYLOAN about our visit in the MFI CEPESIU in Ecuador. Radio interview #2 in Allo la Planète on le Mouv’ (Radio France)! Listen to us from 57’43” to 1h 07’24”! Article by our microcredit partner BABYLOAN about our visit in the MFI AFODENIC in Nicaragua. Radio interview #1 in Allo la Planète on le Mouv’ (Radio France)! Listen to us from 43’04” to 56’38”! Article from our partner l’Agence Français de Développement on their blog AFD Solidaires du Monde. Article from our partner the BRED on their website BRED Sociétaires. Article by our microcredit partner BABYLOAN about our visit in the MFI CHAMROEUN and CBIRD in Cambodia. Article by our microcredit partner ENTREPRENEURS DU MONDE about our visit in the MFI STEP (ex NCRC) in Kolkata, India. Microcrédit en 4L marked 2013, read on the SEINE MARITIME website. On the occasion of a press conference with the French Development Agency in Hanoi, Vietnam, a few articles were published in online news websites such as : Vietnam+, Dan Tri, Doi Song Phap Luat and Bizlive (in Vietnamese). Article of LE PETIT JOURNAL DU CAMBODGE in Phnom Penh, Cambodia. Conference on Nepal organised by the Mairie and the Scouts and Guides de France group of Mont-Saint-Aignan with Mr. Didier Benard, French Consul of Nepal. Article of our partner BABYLOAN. For those of you out there who speak khmer, here is a radio interview of RFI recorded in Phnom Penh, Cambodia. Article published by our partner the FRENCH DEVELOPMENT AGENCY of Cambodia. Article on the page 25 of our partner the FONDATION ALLIANCE FRANÇAISE international newspaper of September/October 2013. Microcrédit en 4L mentioned in the newsletter of the Scouts of France of the month of October 2013. Article from our partner BABYLOAN. Article published on the innovation blog of L’EXPRESS. 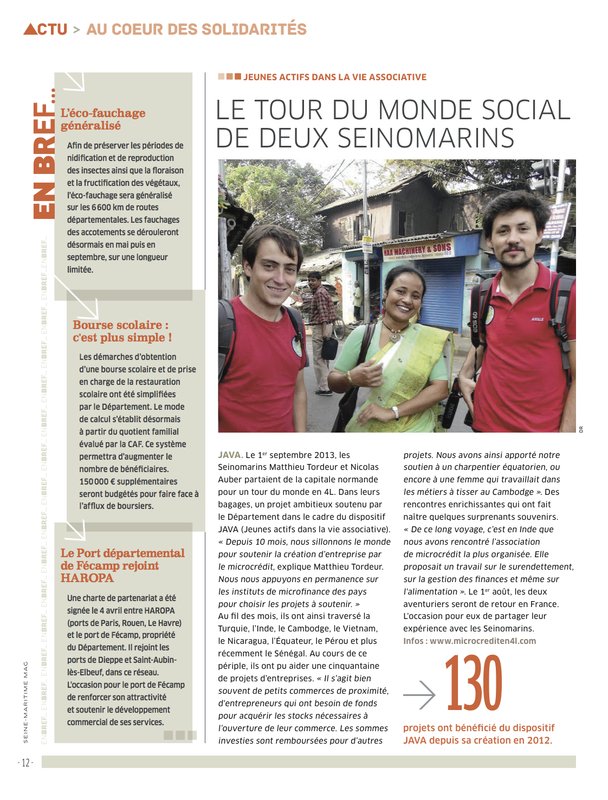 Article published on the page 13 of the Magazine of the SEINE-MARITIME DEPARTMENT, 200,000 copies printed ! Article published on the MICROFINANCE GRAMEEN CRÉDIT AGRICOLE FOUNDATION website. Article published by our partner, the BRED bank. Article published in LE MAG’ of Mont-Saint-Aignan, you can read it below in PDF. Radio interview broadcasted on FRANCE BLEU HAUTE-NORMANDIE. Radio interview broadcasted on RCF. TV coverage from FRANCE 3 NORMANDIE. TV coverage from LA CHAÎNE NORMANDE. Article from our partner the FRENCH DEVELOPMENT AGENCY on their blog Objectif Développement. Photo slideshow from the farewell party of the MAIRIE OF MONT-SAINT-AIGNAN. Radio interview broadcasted on NRJ. Article of the Seine-Maritime department published on SEINEMARITIME.NET. Article published on TENDANCE OUEST ROUEN. Microcrédit en 4L is mentioned at the end of an article on LE MONDE. Article published on the website of GRAND-ROUEN. Article and video published on the website of our partner L’EXPRESS. Article published in the PARIS-NORMANDIE daily regional newspaper, you can read it below in PDF. Article published on the website of REPORTERS D’ESPOIRS. Article published on the website of our MFI partner ENTREPRENEURS DU MONDE. Radio interview of Matthieu Tordeur broadcasted by the WHAT THE COM ? (WTC) team.